There is a big difference between hearing aids and hearing health care! 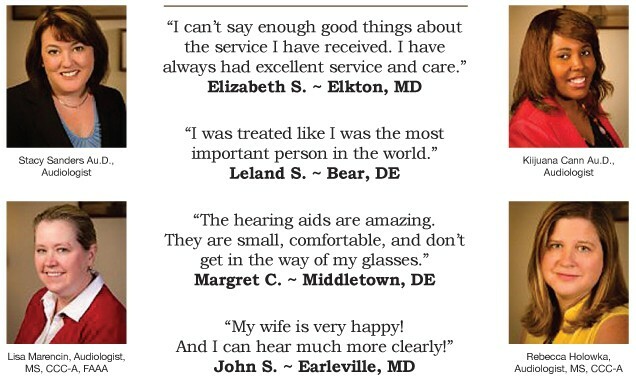 For over 20 years, the audiology staff at Hearing Services of Delaware has been helping people in Delaware hear better by providing the highest quality hearing health care, in addition to fitting hearing aids. Our commitment to helping people hear better is exemplified by our Complete Hearing Health Care Program which includes: Warranties Up to Three Years to Cover Loss & Damage and Repairs, a 45-Day Satisfaction Period, Regular Cleanings & Adjustments, an Annual Hearing Instrument Evaluation, an Annual Presentation of New Technology, and Batteries Provided for Five Years!